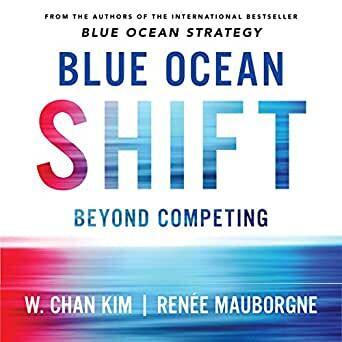 Blue Ocean Shift is the essential follow-up to Blue Ocean Strategy by world-renowned professors Chan Kim and Renée Mauborgne. Drawing on more than a decade of new work, Kim and Mauborgne show you how to move beyond competing, inspire your people's confidence and seize new growth, guiding you step-by-step through how to take your organization from a red ocean crowded with competition to a blue ocean of uncontested market space. By combining the insights of human psychology with practical market-creating tools and real-world guidance, Kim and Mauborgne deliver the definitive guide to shift yourself, your team, or your organization to new heights of confidence, market creation, and growth. They show why nondisruptive creation is as important as disruption in seizing new growth. Blue Ocean Shift is packed with all-new research and examples of how leaders in diverse industries and organizations made the shift and created new markets by applying the process and tools outlined in the audiobook. Whether you are a cash-strapped start-up or a large, established company, nonprofit or national government, you will learn how to move from red to blue oceans in a way that builds your people's confidence so that they own and drive the process. With battle-tested lessons learned from successes and failures in the field, Blue Ocean Shift is critical material for listeners, managers and entrepreneurs alike. You'll learn what works, what doesn't and how to avoid the pitfalls along the way. This audiobook will empower you to succeed as you embark on your own blue ocean journey. Blue Ocean Shift is indispensable for anyone committed to building a compelling future.